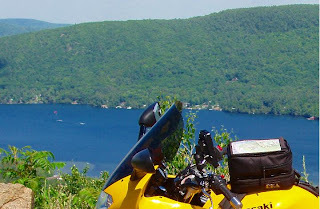 A couple of days ago I registered for my favorite motorcycle rally, Americade, centered on Lake George, New York. Thomas Jefferson described Lake George as the "Queen of American lakes". Americade is the largest "touring rally" (i.e. a centrally-organized event; not a "Bike Week" type of "happening") in the world, with 50,000+ registered attendees the last few years. Unregistered thousands more will also show up. This will be my 7th Americade in the last 9 years. It's great fun with tons to do, including seminars by noted moto-journalists and travelers, skills shows, demo rides, bike judging, field events, guided and unguided tours, and charity Poker Runs. It also features a giant motorcycle trade show, TourExpo. Now all that's great, but I tend to spend most of my time just riding all those twisty roads and mountain gaps in the Adirondack National Park (the largest in the continental US!) and nearby Vermont. I usually find time to meet up with various Americade friends (most of which I only see during Americade) for a couple of breakfasts and dinners at times and locations that have become traditional over the years. Great article and cool picture. I am planing to ride to Prospect Mountain with my riding buddies I met on bikerkiss.com next week. Are you interested in joining us? Thx for visiting my little blog and for the invite. I can't make it next week, but I'll ride it as always during Americade week. I go early in the week when I usually have the mountain pretty much to myself. Save a few bux. NYS has a toll fee for Prospect Mtn but if you have an Americade wristband and ride up with the Sat parade, it's free.